The full amount of the passage fare or rental car must be paid for using your TD First Class Travel Visa Infinite Credit Card and/or your TD Points in order to be eligible for the benefits. This insurance plan automatically protects most new items purchased anywhere in the world for 90 days from the date of purchase. If the item is lost, stolen or damaged, it will be replaced or repaired, or you will be reimbursed for the purchase price. 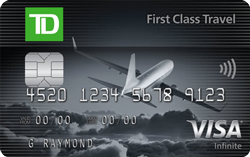 Only items that were paid for in full with your TD First Class Travel Visa Infinite Credit Card are covered by this plan. This insurance plan either doubles the length of the item’s manufacturer’s warranty coverage or extends it by 1 year—whichever is lesser. Only items that were paid for in full with your TD First Class Travel Visa Infinite Credit Card are covered by this plan. If you have to cancel your trip before it has even started, your eligible expenses can be reimbursed up to $1,500 per person and $5,000 for the entire trip. Note: The full cost of the trip must be paid for using your TD First Class Travel Visa Infinite Credit Card and/or your TD Points in order to be eligible for the benefits. Note: The ticket must be paid for in full using your TD First Class Travel Visa Infinite Credit Card and/or your TD Points in order for coverage to be activated. Coverage is in force while baggage is in the custody of the common carrier.